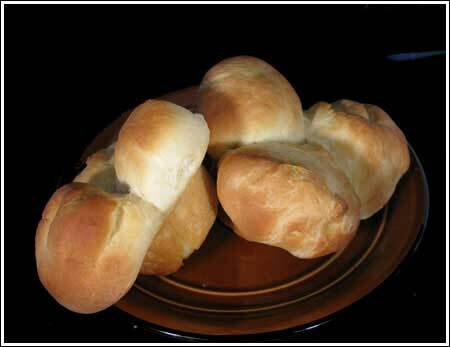 Cloverleaf Rolls that are similar to the ones served at Luby's. This version is one I have corrected over the years. If you only want to use 1 packet of yeast, use the measurements in the "Notes" section. In a large mixing bowl, dissolve yeast in warm water. Add 1 cup of the flour, melted butter, sugar and eggs and stir until blended. Add dry milk powder and salt and mix well by hand or using the paddle attachment of the blender. I like to do this part by hand to get a feel of the dough. Stir in about 3 more cups of flour to make a very soft dough. Begin adding remaining cup of flour 1/4 cup at a time until the dough is slightly dryer, then attach dough hook and let the mixer knead. Dough should leave the sides of the bowl but stick to the bottom. If needed, add more flour. Lightly grease top of dough with oil. Cover loosely and let rise in warm place 1 hour or until doubled in size. Punch dough down. Divide dough evenly into 18 pieces (or 24 pieces for smaller rolls). Divide each piece into 3 balls and place in muffin cup. Let rise in a warm place for about an 1 hour. Preheat oven to 350°F Bake 15 to 20 minutes or until golden brown. Brush with extra butter if desired. The recipe in the Luby's book calls for 1 ounce of active dry yeast, but I think they meant cake yeast because 1 oz of cake yeast is equal to about 1 1/2 packets or a little over 3 1/4 teaspoons of active dry yeast. Also, the original recipe must have been made in jumbo muffin cups because these are very large. If you use standard size muffin cups you can make more than 12 (smaller) rolls. And finally, if you just want to use 1 packet of yeast, the following measurements work. 7 oz of water, 1 packet of yeast, 1/3 cup granulated sugar, 1/4 cup powdered milk, 4 tablespoons melted butter, 1 teaspoon salt, 1 pound of flour (3 1/2 cups) plus more as needed.